【Selected Material】: The OUTDOOR DOIT grill cover is made of a new type of special material that is super lightweight but has a long life and can withstand extreme harsh weather conditions. The new material is heavy duty Oxford fabric with waterproof PVC coating that can last through all seasons. It can support UV protected, water resistant, Dustproof and Crack resistant. 【Fitting Size】: 58" (L) x 24" (W) x 48" (H) (147cm x 61cm x 122cm) is available size of grill cover. The PREMIUM barbecue grill cover fits most popular brands of grill, such as Weber, Kenmore, Brinkmann, Jenn Air, Holland and Char Broil etc. 【Easy Fitting and Folding】: The grill cover is made of new high-tech materials, so it is light、firm and durable, easy to use and easy to fit the grill. It is also very convenient for folding and storage. 【Easy Cleaning】: The OUTDOOR DOIT gas grill cover is easy to clean, rinse it with water and dry it in the sun. 【Anti-Wind Design】: Never worry about your grill cover being blown away by the strong wind, for the Nylon lock and rope can hold the grill and grill cover tightly together. 【Best Warranty】: we offer 12 Months Warranty, 60 Days Money Back Guarantee and good customer service. Such as grill cover, let me tell you my story. I still remember clearly, that was a Sunday afternoon, it was raining, cloudy and windy outside. My whole family was sitting around, I mean my son, my daughter my wife and I, we were sitting in a warm comfortable room, eating fruits, talking happily. At that moment, when I look outside from my window, I saw the grill standing alone there like a naked boy in the heavy rain, abandoned, dirtied, suffering from cold and raining. At that moment, oh, I need a grill cover; if you have the same feeling before as me, take it home. 【Fitting Size】: 58" (L) x 24" (W) x 48" (H) is available size of grill cover. The PREMIUM barbecue grill cover fits most popular brands of grill, such as Weber, Kenmore, Brinkmann, Jenn Air, Holland and Char Broil etc. 【Easy Fitting and clearing】:The grill cover is made of new high-tech materials, so it is light、firm and durable, easy to use and easy to fit the grill. It is also very convenient for folding and storage. 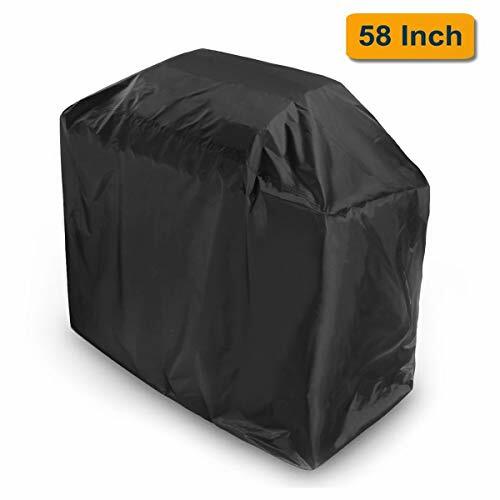 The OUTDOOR DOIT gas grill cover is easy to clean, rinse it with water and dry it in the sun. 【Best Warranty】: We offer 12 Months Warranty, 60 Days Money Back Guarantee and friendly customer service. If you have any questions about this product by OUTDOOR DOIT, contact us by completing and submitting the form below. If you are looking for a specif part number, please include it with your message.